Morning Pointe of Chattanooga – Shallowford resident Sybil Bryant makes new friends in Grace Academy students Destiny and Bailey. 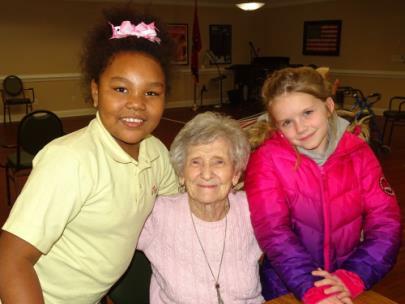 Since the start of the new year, students from Grace Academy and the residents of Morning Pointe of Chattanooga – Shallowford (TN) have bonded over a unique project: a letter exchange between the elementary school and the assisted living community. As the students learn to write in cursive, they practice this new skill by writing letters to Morning Pointe residents—who then respond in cursive with letters of their own. “The pen pal program has been great for everyone involved,” said Holly Holcomb, the Life Enrichment Director at Morning Pointe of Chattanooga – Shallowford.